Sadhana divas celebration was held on 19th November at Vivekananda Kendra, Karnawati. 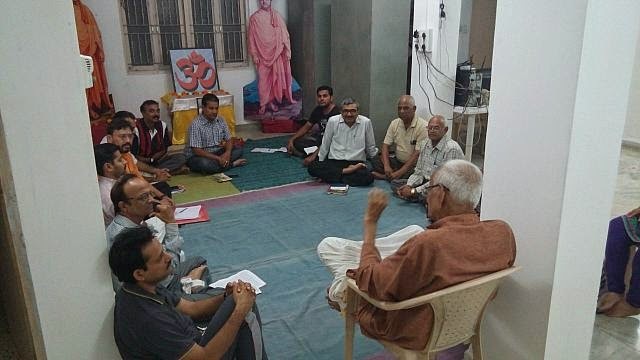 Total 19 karyakartas were present in the celebration of the sadhna divas. Program was started with 3 Omkar and Prarthna and Geet. Prant Parva Pramukh Shri Dr. Kamlesh Upadhyay gave elaborate information on “Sadhana Divas”. He explained the concept behind Kendra’s thought and importance of work in the every ones life. After that Ma. Mamaji shared some priceless incidences of Ma. Eknathji and explained how Eknathji leaved Kendra Prarthna, each second, till the end of life. Mamaji told that for Ekanathji, ‘One life- One Mission’ was truly a life sentence and he leaved on the same. Ma.Eknathjis’s life and his working style inspired a lot. All karyakartas present have taken three Sankalp each for a) self for b) Vevekananda Kendra & c) for the Rastra. Programme ended with Pusparpan and Kendra Prarthana.